High levels of tritium, a radioactive material, leaked into the groundwater around a nuclear plant located less than 30 miles outside of New York City, state officials said Saturday. 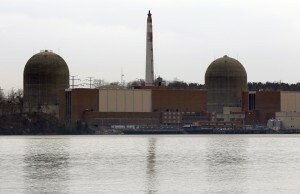 Nuclear regulators said the public is not at risk, the AP reported. New York State Gov. Andrew Cuomo said the facility, operated by the corporation Entergy, reported “alarming levels” of radioactive tritium that contaminated three of 40 monitoring wells. One well spiked 65,000 percent above permissible levels, the governor said, while noting that none of the material left the site. The radioactive levels recorded this week are “significantly higher” than those discovered multiple time over the last few decades, according to Cuomo, who sent a letter to state health and environment officials on Saturday. “Our first concern is for the health and safety of the residents close to the facility and ensuring the groundwater leak ‎does not pose a threat,” Cuomo said. In a statement, the company said the tritium found in the monitoring wells did not enter local drinking water supplies or present a safety hazard to the public. “While elevated tritium in the ground onsite is not in accordance with our standards, there is no health or safety consequence to the public, and releases are more than a thousand times below federal permissible limits,” Entergy. “Plumes of radioactive levels have leaked and reached groundwater in the past,” said Cliff Weathers, the organization’s spokesperson. State and federal officials have launched an investigation to “determine the extent of the release, its likely duration, cause and potential impacts to the environment and public health,” Cuomo said. The federally controlled Nuclear Regulatory Commission will also review the incident. Entergy Indian Point Energy Center is located along the Hudson River in the town of Buchanan in upstate New York. About 17 million people live within 50 miles of the nuclear plant.